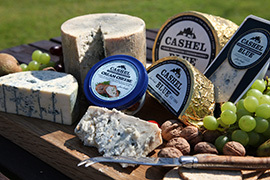 Mash together the Cashel Blue cheese and butter in a small bowl. Season with pepper and stir in the chives. 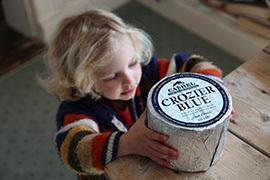 Shape into a short cylinder, no more than 5 cm (2in) in length, and wrap in cling film. Chill for at least 1 hour or up to 24 hours to firm up. 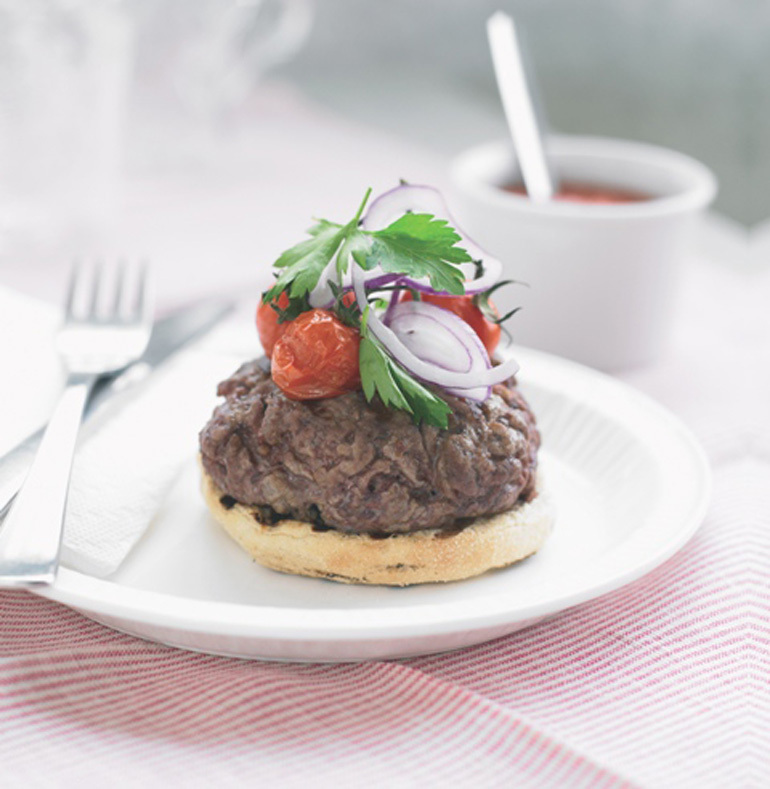 Divide the beef into four portions, then, using wet hands, shape into patties that are 2.5 cm (1 in) thick. 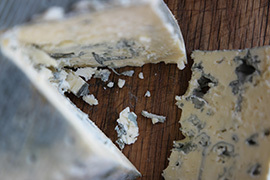 Remove the blue cheese butter from the fridge and cut into four even-sized pieces. Make a deep indentation in the middle of each patty and push in a piece of the Cashel Blue butter, pushing the beef back around the mixture so that it is well sealed. Chill for at least 1 hour or up to 24 hours until ready to cook. Preheat the oven to 200C (400F), Gas mark 6 and preheat the grill or if using a charcoal barbecue, light it 30 minutes before you want to start cooking. If using a gas barbecue, light it 10 minutes beforehand. Snip the baby vine tomatoes into four portions of three and arrange in a small roasting tin. Drizzle over one tablespoon of the olive oil and season to taste. Roast for 12-15 minutes until lightly charred and just beginning to soften. Sprinkle a teaspoon of pepper all over the chilled burgers. Add to the grill rack and cook for 4 minutes on each side for rare, 6 minutes each side for medium and 8–9 minutes for well done. To make the dressing, mix together the remaining two tablespoons of the olive oil with the lemon juice and sweet chilli sauce. Place the parsley and red onion in a separate bowl and then fold in two-thirds of the dressing. To serve, toast the cut sides of the muffins on the grill rack and place on warmed plates. Cover with a burger and then add a bunch of roasted tomatoes. Pile the red onion salad on top and drizzle over the remaining dressing.